1. For Clogged Nose: A clogged nose is a great irritant. You have difficulty in breathing; your taste sense is hampered, and let’s not forget the headache and exhaustion that follows. Ayurvedic experts use the Nyasa treatment for cold and it involves pouring a few drops of warm pure cow ghee into the nostrils, first thing in the morning. 2. Good Source Of Energy: Ghee contains medium and short-chain fatty acids, “of which, lauric acid is a potent antimicrobial and antifungal substance.” Nursing mothers are often given ladoos loaded with ghee, since they are loaded with energy. 3. Source Of Good Fat: If you are on a weight loss spree? Fats, carbs and proteins are three macronutrients that are essential for sustaining a healthy life. Removing any food group from your diet is never a sustainable way to lose weight. What you do need to do however is – choose better. Avoid all bad fats in fries, burgers and processed junk, and choose better alternatives in the form of ghee, avocados etc. 4. Good For Intestinal Health: Ghee happens to be one of the highest quality food sources of butyric acid, which makes it an ideal pick to support the health of the intestinal walls. 6. Good For Heart: Much like all fats, ghee too has been guilty of raising cholesterol levels. But contrary to popular belief, ghee is in fact a much safer bet to invest in for heart health as compared to refined oil. 7. 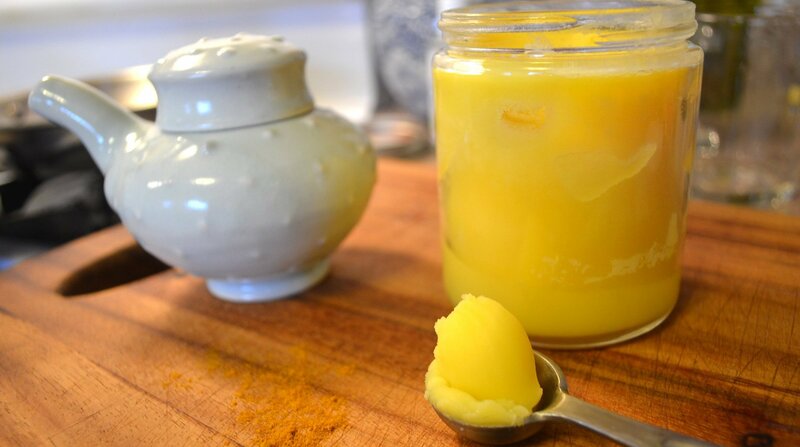 Great For Skin: Vital fatty acids in Ghee act as a nourishing agent that can do wonders to infuse life in your dull skin. Ghee is known to be suitable for all skin types and it also has vital fatty acids that help in hydration of the skin cells. All treatments need to be supervised by an Ayurvedic Physician. Itoozhi Ayurveda specialises in various therapies and conducts regular clinics.